In order to use System File Checker, type in the Start Menu search field the word 'command'. The first result should be the Command Prompt. Right click on it and select 'Run as administrator'. After the UAC (User Account Control) prompt will show up, click on Continue. Alternatively, you can find the Command Prompt by going to 'Start -> All Programs -> Accessories'. In the Command Prompt window, type sfc and you will see a command list with explanations for each one of them. 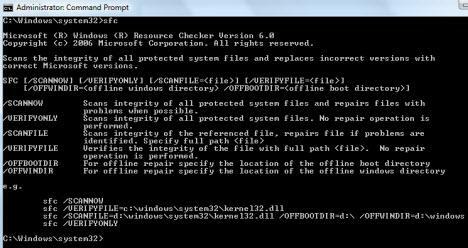 sfc /verifyonly - Scans integrity of all protected system files without repairing any. sfc /scannow - Scans integrity of all protected system files and repairs files with problems when possible. can you help me with these??? I tried that command but the sfc say that some of my files are corrupted and was unable to repair? do you have any idea how can i recover it? I did the system file checker and it "found corrupt files but was unable to fix some of them". Now what? Is there another way of fixing them without doing an entire system restore? was having a few dramas with Vista (predominately not being able to get itunes installed and working with my iphone after something like 14 months of trying everything I could find on the net, and the occasional crash) I therefore jumped at teh chance to trial the new Windows 7, which was touted as a completely different experience to Vista. Now I have crashes daily, I tunes wont install at all, and there are that many other bugs and glitches that I wanted to return to Vista. Now my computer crashes when I try to reinstall Vista. I have owned PC's and Laptops for nearly 20 years, and I now (perhaps too late) will be moving on to Apple. I have never heard of the troubles that I experience with Windows with any Apple computer and can't wait to fork out the extra money top upgrade. I think Microsoft is a sinking ship. Bail out now people. So now what? After the scan was complete, there are files that couldn't be fixed. Now what do I do to get my computer to work? Not just work properly, but work at all? I'm trying to install windows v sp1 but it always fails and displays error 800f081f. what do i do?